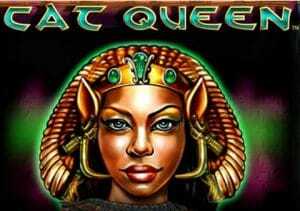 Take a trip back in time to the land of the pyramids in Cat Queen, a 5 reel, 40 payline video slot from Playtech. Featuring high class design, this Ancient Egyptian themed game is a highly volatile affair whose main attraction is the quality free spins feature that comes with stacked wilds. Play from between 40p and £800 per spin. The sound and visuals on offer in Cat Queen are top class. The setting is the interior of a pyramid – the reels feature a selection of hieroglyph symbols including the gods Seth, Bastet and Horus as well as the Eye of the Horus, Ankh and the Scarab. There’s no playing card filler here. All of the symbols are bright and bold yet also neat and crisp. Enhancing the atmosphere is the north African style soundtrack which is a big improvement on many generic offerings. A big thumbs up for the designers then. As far as payouts go, the Pharaoh is the most rewarding of the standard symbols, paying 200 coins if you manage to land 5 on a payline. The Cat Queen is the game’s wild, replacing all other symbols apart from the scatter – 5 wilds in a row will get you 1,000 coins. The wild can land in stacked formation which can quickly get the coins flowing. At first glance, a single bonus feature offering up to 30 free spins and no multipliers may sound a little unadventurous. Don’t be mistaken though, the seemingly innocuous bonus feature can deliver a mighty punch thanks in large part to the stacked wilds that frequent the reels. To trigger the Free Games feature, you’ll need to land 3 or more of the pyramid scatter symbol. As well as a bonus payout of 5, 10 or 50 times your stake, you’ll be awarded 15 free spins. Land the stacked wilds on multiple reels and the results can be pretty spectacular. You can also retrigger the feature giving you up to 30 free spins in total. On the surface, Cat Queen seems like any number of Egyptian themed video slots but there’s plenty lurking beneath the shiny exterior. This is a high variance game – expect spells drier than the desert. Get lucky with the stacked wilds in the bonus feature though and Cat Queen can really deliver. If you like the theme, you cannot go wrong with Novomatic’s Book of Ra Deluxe or IGT’s Cleopatra.